The Dragon is the fifth sign of the Chinese horoscope. The Dragon is Yang and is fixed to the Wood element. The characteristics of the Dragon correspond to the occidental sign of Aires. Yang is positive, masculine, and associated with the Day. 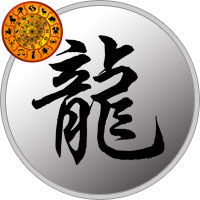 Objective Yang signs depend more on others than themselves. You tend to be outgoing and more physical than spiritual. As all opposites attract in nature, Yang attracts Yin. The Wood association bestows a moralistic and ethical outlook to life. Wood people are self-confident and have better than average executive and persuasive abilities. There is no sign more venerated in Chinese Astrology than the Dragon. Proud, strong, and self-assured, the Dragon is a sign of nobility and power. Chinese Emperors used this very symbolism to represent themselves, regardless of what year they were born. Those born during the year of the Dragon are gifted with eloquence, idealism, and tenacity. Dragons don’t have to ask for things, they demand them. They can be dictatorial and inflexible in their associations with others, but at the same time be the warmest, most gentle individuals you may meet. Dragons are full of life and vitality, encouraging those around them to be their best while maintaining a powerful, exotic presence amongst their peers. It can be difficult for Dragons to see things from outside perspectives. Deep down those born during these years know that they are special. Usually gifted in a particular talent, they are also very lucky. Dragons were born to take charge, to succeed at what they focus on, regardless of whether their intentions are good or bad. As you might have guessed, Dragons can abuse their power just like anyone else. They don’t like taking orders from anyone, as they alone were born to take charge and command their people. There are 12 Primal Zodiac signs for the Eastern Zodiac sign of Dragon, one for each sign of the Western Zodiac.